War is in the dance! One of last year’s best tunes was Keida’s excellent Stand For Something. Now – finally – comes a one riddim compilation with nine cuts of the heavyweight riddim. And it’s voiced by a great bunch of vocalists from Jamaica, Europe and the U.S.. How about Pressure, Bobby Hustle, Exco Levi, Khari Kill, Gappy Ranks, Rob Symeonn, Rocker-T, Addis Pablo & The Suns of Dub and of course Keida. War is in the Dance riddim is produced by U.S.based Royal Order Music and drops on October 21. Until then you can check the megamix by Selecta Daniel below. Capitol 1212 are Professa Fresh and Fly T, two Edinburgh based DJ’s and producers that started to make music together in 2007. Since then they have been busy releasing various singles and EP’s on different labels, including their own 1212 Records. Now, seven years after of honing their craft behind the mixing desk, all of their influences come together on their debut album The Return of Rudy Nacho, an explosive and intoxicating mash-up of hip-hop, ska, reggae and jungle flavoured with a serious dose of carnival vibes. And sound the air horns, because this is an irresistible and stylish album filled with seductive hooks and infectious melodies set to boastful beats and pulsating riddims. Many genres with big bass lines come together very nicely. For this album Capitol 1212 has collaborated with vocalists like Tenor Fly, Serocee, Gappy Ranks, Deadly Hunta and Million Dan. And these vocalists battle beats with clever samples. Makin’ Disturbances, with Serocee on the microphone, borrows from Justin Hinds’ classic Carry Go Bring Home, and Daddy Scotty’s Everybody Move Like Robot uses elements from The Uniques’ smooth My Conversation and Hopeton Lewis’ delicate Take it Easy. Some of the vocalists also need to handle unexpected tempo changes, and the best examples are Lif Up with veteran deejay Tenor Fly on vocals and Murder Dem with the gruff Deadly Hunta. Both cuts start with booming beats and then – suddenly – strobe lights jump in and give you a heart-attack. 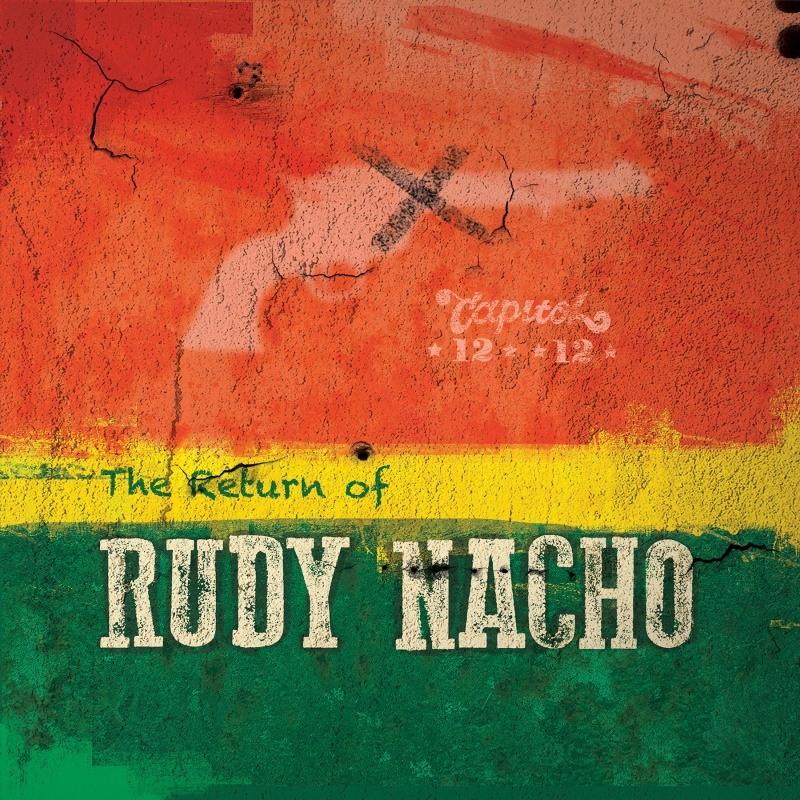 The Return of Rudy Nacho collects 13 tracks, including one intro, one interlude with MC Donald D talking about the hip-hop/reggae connection and one outro. The other ten tracks are pure dance floor mayhem, with Gappy Ranks’ grim Born as a Warrior – now available as free download – being one prime example. Check it below. Never Stray is one of the strongest cuts on Jah Sun’s excllent album Rise as One. It’s a combination with Gappy Ranks, and it was great news when I found out that the label behind the production – Italy’s Bizzarri Records – had put out a one riddim album based on that particular riddim. 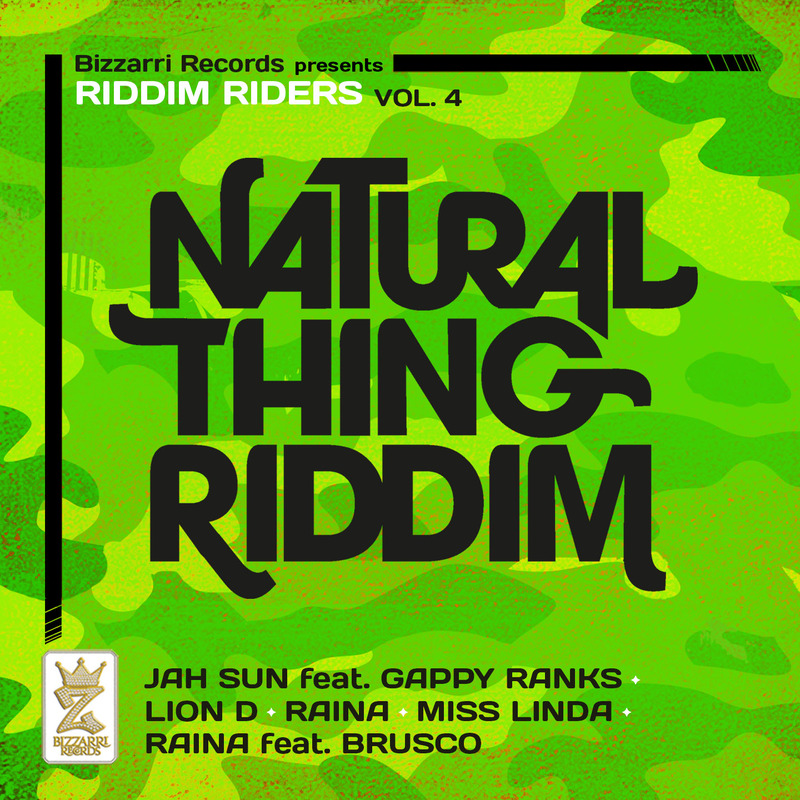 Natural Thing riddim follows the label’s Laba Laba riddim and comes with ten cuts and two versions, one reggae and one dancehall. Apart from Jah Sun and Gappy Ranks, the riddim features four Italian artists – Raina, Lion D, Miss Linda and Brusco. Ths riddim is pure niceness and is currently only available via Reggaerecord, but hits other digital platforms on January 19, 2014. Between December 19 and January you can get the dancehall version of Sun’s & Gappy’s Never Stray for free via Reggaerecord. 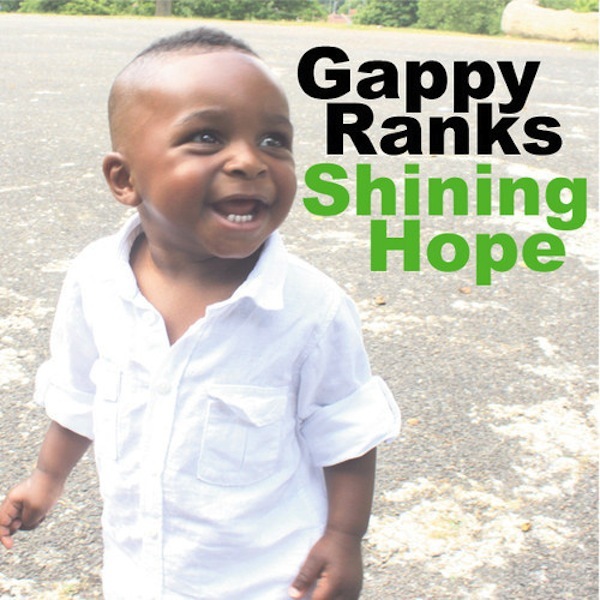 Gappy Ranks’ third album Shining Hope is his most pop-oriented yet with lots of catchy choruses, strong melodies, la-la-la’s and auto-tune. It hosts a broad variety of producers from Jamaica, Europe and the U.S., including Macro Marco, Bost & Bim, Kemar McGregor, Royal Order Music and Notice Productions. Shining Hope doesn’t contain any vintage reggae and rocksteady gems like his debut album Put the Stereo On, nor does it collect any hard-edge dancehall like his second album Thanks & Praise. Shining Hope is rather a contemporary pop album heavily influenced by sweet reggae music. And just as the album title and the cover sleeve – a photo of his son Japan – suggests, this is a bright, uplifting and personal album. Gappy Ranks sings about seizing the moment, overcoming tough boundaries, relationships and being in love with an ex-girlfriend. It’s bursting with joy and it’s hard to stop smiling when you listen to tracks such as Tomorrow Loves You, Sell Out and the Exco Levi combination Everything Gonna Be Alright, which borrows quite a lot from Bob Marley’s popular Three Little Birds. 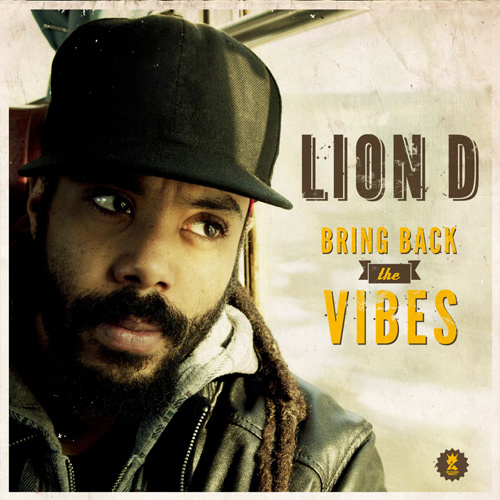 Italian/Nigerian singer and singjay Lion D’s third and latest album Bring Back the Vibes is a perfect example of how great contemporary European reggae can sound. It has the usual blend of one drop riddims, hip-hop, soul and dancehall, but this album also incorporates gospel and blues, mostly in the form of a sweet harmonica provided by Lee Jaffe, who played with Bob Marley and The Wailers. The album aims to bring roots reggae and dancehall from the 80’s and 90’s into the spotlight. And the result is very successful, even though Bring Back the Vibes has a very contemporary feel with its high energy and hip-hop flavored beats. It’s positive and conscious and Lion D deals with spirituality, romance, unity, equality, struggle for work – something German roots reggae singer Uwe Banton also did on his latest album Mental War – and self-respect, as in one of the album’s several highlights – No Bleaching Cream. The tasty and tight riddims are mostly supplied by the Livity Band and composed by Magista. Onboard is also talented Jamaican singer Nikki Burt, who provides excellent harmonies on several songs, and a number of guest artists – Ras Tewelde, Gappy Ranks, Skarra Mucci and Blacky Grace. The album collects 18 songs, of which two are short interludes from the cult motion picture Rockers and one a cappella intro and one acoustic outro. There are actually several acoustic efforts, and the ukulele-led So Beautiful sounds like someone has put Bruno Mars in a studio in Kingston. The set mixes unreleased and already released material as well as relicks and fresh originals. A lethal hip-hop fueled version of Inner Circle’s monster hit Sweat (A La La La Long) turns up surprisingly, whereas versions of Carl Meeks’ Weh Dem Fah, Eek-A-Mouse’s Wa-Do-Dem, The Techniques You Don’t Care and Jackie Mitto’s Mission Impossible are more expected choices. Lion D’s deep voice and phrasing sounds a bit like dancehall superstar Busy Signal, and where he uses the catchphrase “hotter” Lion D favors “wah dis” in a similar manner. Lion D is also – just as Busy Signal – a versatile performer that can go from singing to gruff deejaying in just a few. The press release describes Lion D as one of the most promising talents on the international reggae scene. Not sure that’s true, but he’s definitely – along with artists like Skarra Mucci and Gappy Ranks – one of Europe’s most interesting individual artists and one to keep an eye on. Three of Jamaican singer Freddie McGregor’s albums are for me all-time classics – Mr. McGregor, Bobby Babylon and Big Ship. All recorded and released in the late 70’s and early 80’s, prior to him switching to a poppier and more lovers-oriented direction focused on the crossover market. I haven’t paid much attention to his output since the massive Big Ship album for Linval Thompson, even though he has put out lots of successful albums and singles, particularly the Jamaican Classic series in the 90’s. 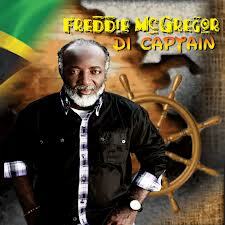 Freddie McGregor’s latest album is his first in seven years – during this time he has mentored his acknowledged sons Stephen “Di Genius” McGregor and Chino – and continues in the maritime vein. On Di Captain this smooth and soulful singer has set sail on a warm, elegant and polished musical journey accompanied by producers C & R McLeod, Dalton Browne, Steelie & Clevie and Stephen McGregor along with a number of acclaimed Jamaican and British musicians, including Leroy Sibbles from The Heptones on bass. This 16-track collection has taken four years to complete and includes fresh originals, the festive and celebratory Move Up Jamaica, cover versions, a gentle take on The Heptones’ Equal Rights, romantic ballads, the heartfelt Love I Believe In, and strong cultural messages, as in the redo of his smash hit Bobby Babylon, here titled Standing Strong with Gappy Ranks’ sharing microphone duties. Freddie McGregor’s voice has aged with dignity showcased on this easy-going set, even though I would have appreciated a little more nerve and adventurousness. Di Captain is now available on CD and on digital platforms. In the early 60’s George “Peckings” Price relocated from Jamaica to the UK. He is said to have been a close friend of producer and label owner Clement “Coxsone” Dodd, a very valuable connection when George Price set up his own record shop in London in 1974. George Price passed away 20 years later and his sons Chris, Duke and Trevor took over the operations, and also started to make their own productions built on riddims from mainly Clement Dodd and the late Duke Reid. Their debut album was Bitty McLean’s On Bond Street, which was released in 2005. It was followed by the compilations Old Skool Young Blood in 2006 and 2009 as well as Gappy Ranks’ debut album Put the Stereo On in 2010. Now another slice of old meets new has arrived, and Old Skool Young Blood vol. 3 picks up where its predecessors left off. The 14 tunes include a number of Duke Reid’s finest cuts of rocksteady riddims. The vocals are provided by singers such as Gappy Ranks and Courtney John as well as lovers rock crooners Peter Hunnigale, Peter Spence, Sadiki and Bitty McLean. The riddims are played by The Supersonics – an outfit led by master saxophonist Tommy McCook – and are beautifully crafted. You simply can’t go wrong with music like this. It’s smooth, melodic and infectious. Just like Gappy Ranks’ “ah ah ah ah aaaah” chorus in his Kooyah Kooyah. George Price should be proud. His sons are doing a great job in keeping the reggae legacy alive. If Gappy Ranks’ Peckings-produced debut album Put the Stereo On from last year was a tribute to Studio One and the heydays of reggae music, his latest album – Thanks & Praise – is a completely different story. Thanks & Praise is contemporary reggae and dancehall produced by eight different producers. It is more in the same vein as the EP Rising Out of the Ghetto released in 2010. The only tune that sounds like the debut album is One Day at a Time. It is sung over a version of the Small Axe riddim, originally produced by Lee Perry for Bob Marley in the early 70’s. Put the Stereo On is a great album and was a very promising debut album. It had its problems though, especially the use of auto-tune. And this is repeated on Thanks & Praise. Auto-tune is present on almost every tune. Sometimes it is used with good effect, but mostly it is just disturbing and irritating. Despite auto-tune, there is some great music on this radio friendly urban album. The title track, Could a Run Away with Delly Ranx and Tun Up featuring Russian are certainly extremely catchy. While Put the Stereo On rendered interest among vintage reggae fans, Thanks & Praise will probably appeal to a new crowd. You should definitely check this album out, but listen before you buy. Earlier this year UK-based singjay Gappy Ranks dropped his debut EP Rising Out of the Ghetto as well as his debut album Put the Stereo On. Two very different efforts. While the former had a contemporary dancehall approach, the latter relied on vintage riddims from Studio One, Treasure Isle and Bunny Lee. Now Gappy Ranks has scheduled a new album release. In February Hot Coffee Music will put out Thanks & Praise, an album that is said to be modern and uptempo, probably in the same vein as Rising Out of the Ghetto. It’s produced by Notice Productions, Special Delivery Music, Macro Beats, Jazzwad, Bass Runner, Clay Records and Gappy Ranks himself. Included are singles such as Stinkin’ Rich, Thanks & Praise, Longtime and English Money. Thanks & Praise is scheduled for release on February 15th. 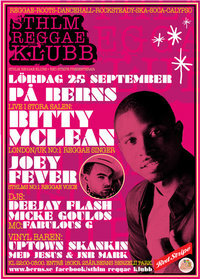 Bitty McLean, one of UK’s finest reggae artists, will perform at Sthlm Reggae Klubb on Saturday September 25th. Bitty McLean has recorded since the 90’s, mostly lovers oriented material. Last year he released his latest effort Movin’ On backed by veteran musicians such as Sly & Robbie and Dean Fraser. But his best work is from 2004, when he dropped Peckings Presents…On Bond Street With The Supersonics. This album was produced by brothers Chris and Duke Peckings, who is behind Gappy Ranks acclaimed debut set Put The Stereo On, released last month. A Peckings production essentially means vintage ska, rocksteady and reggae rhythms. And the Bitty McLean album is no exception. It’s a masterful combination of his soulful voice and some of the finest rocksteady ever recorded by Duke Reid and Tommy McCook in the 60’s. Accompanying Bitty McLean is Swedish singjay talent Joey Fever, probably best know for Young Gunz, a massive combination tune with Million Stylez produced by Curtis Lynch.